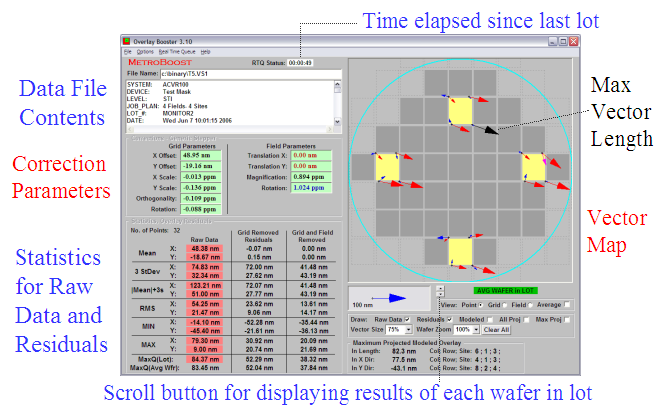 The material on this page describes the advantages of Overlay Booster analysis software in real-time mode. This presentation is especially geared towards facilities that currently use IVS metrology tools and employ other analysis packages for overlay optimization in real-time mode. Click on each key product advantage below for details, or view the presentation (240KB pdf file). Unlike most overlay analysis packages which have evolved from lens characterization, Overlay Booster was designed based on requirements of manufacturing facilities for production applications. Overlay Booster is capable of normal mode real-time operation with IVS tools in a manner similar to other competitive analysis software packages. In addition, MetroBoost and manufacturer of IVS tools have worked closely to develop new features for the total product as experienced by the customer. Thus the combination of Overlay Booster and IVS tools can operate in enhanced real-time mode. The enhanced mode operation capability is unique to Overlay Booster. For enhanced real-time operation, IVS software must also be setup specifically for that mode. Overlay Booster accepts more commands from IVS tools and returns more information. The software can accept commands for both cut-off and sigma filter (i.e. filter by distribution of residuals) in real-time operation. It also returns to IVS the statistics of raw data and residuals for the reduced data set after filtering. This feature is an advantage of enhanced mode operation. Note that in normal real-time mode, IVS software does not accept any statistics from the analysis package. The raw data statistics reported in normal mode correspond to pre filter computations by IVS software, not the analysis package. In the enhanced mode, additional GEM variables have been introduced in IVS software for transmitting the new parameters to the host. MetroBoost and manufacturer of IVS tools have worked together to implement exposure tool analysis models in the combined real-time operation. Several customers have benefited from the additional analysis models implemented since 2002. Some manufacturing facilities employ maximum overlay error as the criteria for lot pass/fail. Overlay Booster keeps track of the maximum overlay for both raw data and residuals and reports them back to IVS. Maximum overlay error reporting is another unique feature of Overlay Booster and is not available in real-time mode from other software packages. What is important to customers is the performance of the total product, the combination of IVS system and Overlay Booster operation in real-time mode. To deliver the desired solution, both components of the product must be taken care of. Nanometrics is the only source for real-time licenses of Overlay Booster for new tools as well as for field upgrades. Nanometrics account managers can recommend solutions for both IVS system software and Overlay Booster. Nanometrics field engineers install both Overlay Booster and reconfigure or upgrade IVS system software for operation in real-time mode. For support, customers can contact Nanometrics directly. Having a single contact for purchase, installation and support of the total product is a key to customer satisfaction. Users especially like the capability to process and view data while real-time mode is running. This unique feature of Overlay Booster provides a competitive advantage. Fab personnel can quickly examine the last lot measured by IVS interactively, or use the software for viewing data from other lots without interfering with real-time operation. Overlay Booster implements a single-pass, simultaneous solution for interfield and intrafield parameters. This is especially important for accuracy of results from small sampling plans used in production whenever the data set is not full-field symmetric. This can occur as a results of either filtering or missed measurement even when the recipe sampling plan is fully symmetric. Thus Overlay Booster provides the most accurate results for sampling plans commonly used in measuring production lots. Overlay Booster returns the analysis results to IVS almost immediately after opening the data file. The results are polled by IVS in less than five seconds. All the information for the lot union is displayed on a single screen. Overlay Booster logs the last two real-time transactions with IVS tools in folders specified at setup time. These folders contain all the information required to recreate the two most recent IVS / Overlay Booster transactions off-line. In addition, Overlay Booster logs the last occurrence of any type of error it recognizes in separate folders. As a Windows-based software, Overlay Booster offers the operating system functionality of Windows® platform, including multitasking capability and familiar user-friendly features. The computer can run other applications while also running Overlay Booster in real-time mode. In some manufacturing operations, users run the real-time mode with Overlay Booster's main window in "minimized" mode. The computer running Overlay Booster is then made available to other users as a workstation for any networked application in the facilities.